Bhubaneswar: Sympathising with the difficulties of the citizens during the unprecedented rains and urban flooding during last couple of weeks, the Bhubaneswar Municipal Corporation (BMC) today celebrated the Local Self Government Day (LSGD) in a low-key manner by hoisting the national flag at the campus of the Central Office. 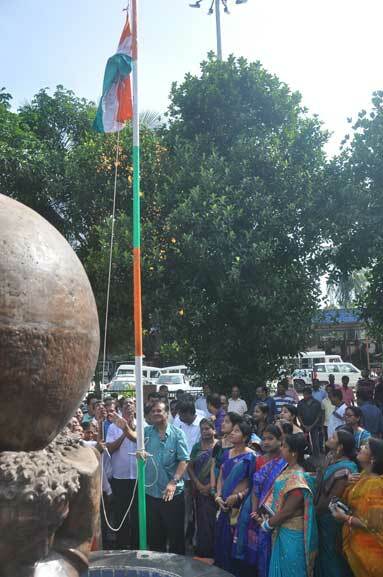 Minister Tourism and Odia Language, Literature and Culture Ashok Chandra Panda hoisted the Tricolour. Mayor Ananta Narayan Jena, MLA Bhubaneswar (Central) Bijay Kumar Mohanty, MLA Bhubaneswar (North) Priyadarshi Mishra, Deputy Mayor K Shanti, Municipal Commissioner Dr. Krishan Kumar, Additional Commissioner Subham Saxena, senior officials and all councillors were present at the ceremony. Later a delegation comprising BMC Mayor Ananta Narayan Jena and MLA Bhubaneswar (North) Priyadarshi Mishra, Deputy Mayor K Shanti and councillors distributed fruits among the in-patients at BMC Corporation Hospital near Lingaraj temple in Old Town area. The team went around the hospital and interacted with the patients both in the outdoor and indoor. Fruits were distributed in gynaecology ward, medicine ward and special cabins. The team distributed fruits to 30 patients in Gynaecology Ward, 15 in Medicine Ward and three in cabins. During the distribution there were doctors, medical attendants and nurses, who were consulted before offering fruits to each patient. Commissioner Dr. Krishan Kumar emphasised better drainage and a series of novel initiatives by the civic and development authorities in transport, street cleaning and maintenance, beautification drives, heritage promotion, branding and conservation and various city festivals so that the Temple City would be transformed into a sought-after world-class destination in future.